The US military is conducting research into the development of rapidly deployable, container mounted nuclear reactors to support deployed American and allied forces, reducing threats to traditional supply and support convoys. With about 52 per cent of all US casualties incurred during the Iraqi and Afghanistan campaigns, the US has recognised that despite its technological advantages and unrivalled global network of defence infrastructure secure, reliable supply-lines, whether air, land or sea, are major-vulnerabilities for any expeditionary force. Furthering these challenges, the growing area-access denial (A2AD) and peer-competitor air, land, sea and cyber capabilities of rivals like Russia and China are directly influencing the future expeditionary, logistics, procurement and supply-chain calculations for the US and its allies, including Australia. Liquid fuel and water supplies comprise the majority of the mass transported to expeditionary forces, with resupply of fuel and drinking water for troops in-theatre costing about four lives for every hundred convoys. In response, the US has initiated a series of programs to develop, test and deploy alternatives to traditional petrol-based fuel systems, particularly for power generation and small-scale manufacturing of key materials like munitions at forward operating bases operating in close proximity to peer-competitors, limiting supply line and convoy exposure to enemy interdiction. The US Army's study, titled 'Mobile Nuclear Power Plants for Ground Operations', highlights the importance of energy on the modern battlefield, saying, "Energy is a cross-cutting enabler of military power and nuclear fuel provides the densest form of energy able to generate the electrical power necessary at forward and remote locations without the need for continuous fuel resupply. "Key points of the Army vision include high-intensity conflict where the Army must be ready to conduct major large-scale combat operations (LSCO) against near-peer competitors." Enter the development of very small modular nuclear reactors (vSMRs), designed to deliver between one and 10 megawatts (MW) for years without refuelling in a rapidly-deployable (road and/or air) package. Both the US Department of Defense and NASA have collaborated on the development of such reactors for use in military and space exploration contingencies. Factory fuelled with system operating life of 10-20 years without refuelling. The HOLOS reactor in particular has been designed to support deployed military requirements, with full-power tested successfully in 2018. 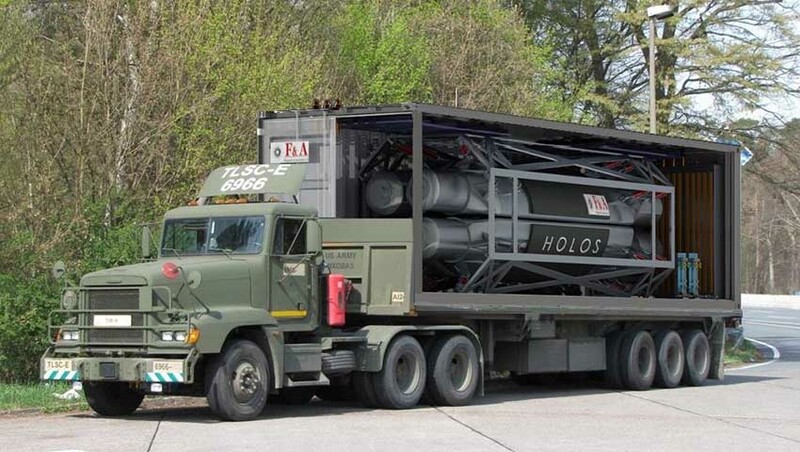 The HOLOS reactor uses a form of low-enriched uranium known as 'high-assay low-enriched uranium' or HALEU, which is neither weapons-grade nor useful in dirty bombs, and satisfies all nuclear non-proliferation requirements. The potential introduction of these systems serves to enhance the operational and deployment tempo of combatant forces. The US, alongside the UK, Russia, France, China and India, have a long-history of developing and operating such miniaturised nuclear reactors, particularly for naval vessels in the form of submarines and aircraft carriers, paving the way for an easy transition to implementing similar systems for deployed land forces.